Time for a more personal post. I recently moved to Fort Myers, FL. This change has been in the works for a few months. The short story is it is time for me to begin my life’s real work. As I’m settling in, and getting used to my new surroundings, I’m finding that my soul is closer to the surface than it has been since I was a little girl. My ‘knowing’ was not something I questioned as a child. I trusted it, and it never lead me astray. One of the major themes that has resurfaced is the theme of truth. It’s all I’ve ever cared about. I have always been empathic. My feelings seem to encompass my entire energy field at any given time. One of the things I’ve heard from people in the psychic community is that it is important to ‘turn off,’ and that it’s not good to be ‘open’ all the time. From a certain perspective I can understand what they mean, however, for myself, this is not possible. My empathic and psychic abilities are intertwined with how I experience the world. To close one off would be like putting on ear muffs, or a blindfold. They all work together. My lesson, though, is in how to interpret all of the incoming information in a way that is comprehensive, and not just pieces that don’t fit together. In essence, my Spirit must learn to become part of my Human/Ego to merge into one Whole Self. I can no longer be a Soul Identity and a Human Identity. It is time for me to be who I truly am. What I’ve found is that when I become clear- that is, my guidance comes through with amazing clarity- there are signs all around me. Tonight as I walked in the light rain, just as the sun was beginning to set in the sky, I had the most peaceful feeling. I looked up, and saw a single, white, fluffy dandelion seed, floating in between the raindrops. It seemed to be invincible to the wet rain drops, and was being carried by the breeze. Every seed is a chance for life to begin anew. I tried to catch it, but it floated upward toward the sky just as I was reaching for it. 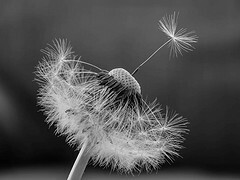 I knew this tiny seed that could float between the raindrops was a sign from God because over the last 3 weeks, I’ve been seeing the little fluffy seeds everywhere- actual dandelions as well as in patterns on clothing and fabrics. They respresent my dream. The seed had a message. When it’s the right time and the right place, nothing can stop my dream from reaching its full potential. I continued my walk and saw a squirrel climbing up a palm tree. This made me smile, as it’s the first squirrel I’ve seen, and Squirrel is one of my Animal Totems. When it reached its desired height, It turned around and looked at me. I greeted him and silently let him know I was grateful for his appearance. It was another sign- a ‘Welcome’ sign. When you trust and follow your guidance, everything seems to communicate with you, and you can easily perceive the interconnectedness of all living things. I look forward to writing more posts, more often, and sharing my journey with you. I thank you, my readers, for being my companions, walking by my side every step of the Way. ~ by healingstarspirit on June 6, 2015.